We have had a bit of a backlog with our blogs on the Cumberworth radical retrofit. The project was actually completed in late Autumn and is now being lived in and enjoyed by our clients. Here we look at our insulation and airtightness strategy for the roof and also heating and ventilation strategies. In the next blog we will look at air pressure test results and PHPP modelling on the house. 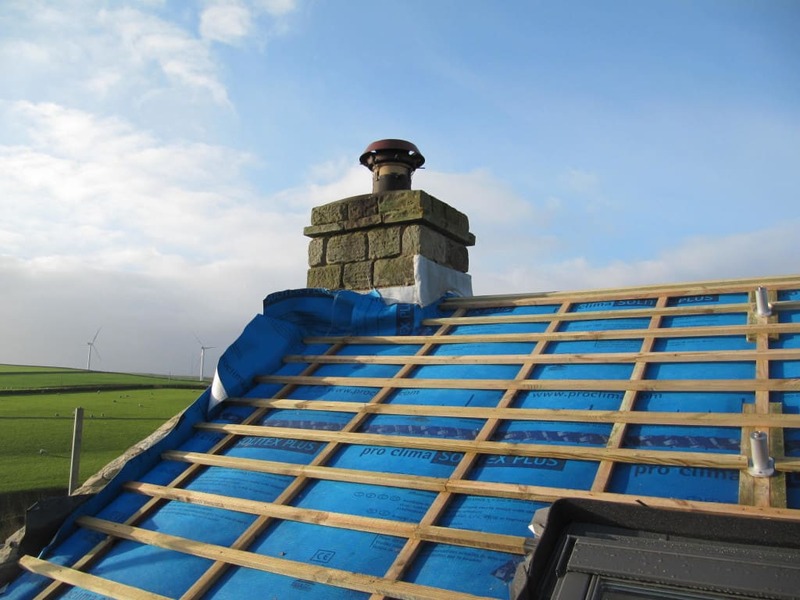 The roof at Cumberworth is a warm or cathedral roof, very similar to that used at the Golcar Passivhaus. The Internal wall insulation joins up with the insulation in the roof for continuity of insulation and minimising thermal bridging. Underneath the roof slates we’ve used Solitex Plus underslaters/ windtightness membrane taped with Tescon No 1, with careful detailing at the eaves and at the verge to maximise airtightness and windtightness.. We’ve then got 250 – 300mm mineral wool (which is what the existing roof structure allowed us to use, without raising the roof). We then used Intello Plus vapour control layer which joins up to be continuous with the internal wall airtightness strategy. Underneath this we used 50mm of PU insulation plasterboard/ laminate board, which we’ve used to minimise the thermal bridging around the roof timbers.. We used Intello for the vapour barrier but as it’s sandwiched between the two insulations this is slightly ‘over-egging the pudding’ in this instance as it can’t use its intelligent properties (eg offering high diffusion tightness in winter and maximum diffusion openness in summer). 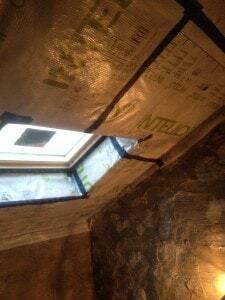 Instead we could have used a cheaper airtightness barrier, such as Pro Clima DA. Early on we decided that trying to reach EnerPHit levels of performance on this project was unrealistic, given the challenges posed by the original building. If we had been going for EnerPHit we would have gone for the Fakro quadruple-glazed roof lights but we felt that, for cost reason, that triple glazed Velux windows, including insulated flashings, would be sufficient. Cumberworth is looking like having a heating load of 4kW (when it’s -10 C degrees outside) which is 10 times better than the original building. As the house is off mains gas, the clients opted for a ground source heat pump heating system which feeds into underfloor heating on ground floor and panel radiators in the top two floors. To get heat pumps to work most effectively, they need to have an operating temperature of around 40 degrees C. This is perfect for underfloor heating which needs to run at 40 degrees C. However, panel radiators normally operate at 80 degrees C so if they are working at 40 degrees they need double sized radiators to get the most efficient output from the ground source heat pump. The house uses solar thermal heating for hot water, backed up by the ground source heat pump. 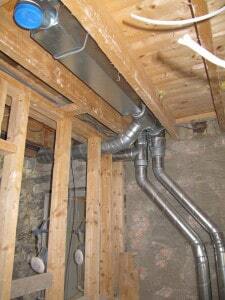 We’re using the usual PAUL 300 unit with our usual trademark rigid steel duct system. Of course fitting MVHR in a retrofit situation is always going to be more difficult. We had to compromise in certain areas with boxing of the ducting..for example in top floor in the warm cathedral roof our clients wanted the roof to go right up to the apex but we had to flatten it off and go instead for a false ceiling at the top of the apex to hide the main ducting. But saying that, our site foreman Jude’s done it really well..there’s a bit of boxing on the middle floor as you go into the bathroom on the landing but it’s difficult to know how else we could have done it. There’s no exposed ducting, it’s not like Stirley barn. The MVHR system is similar to that used at the Golcar Passivhaus although at Golcar it was a big open plan space, with inter-joined room, so we were able to use more of a cascade system for air flows. The Cumberworth project is not open plan and there are a lot more separate rooms, off the central stairwell, so actually it’s a bit more complicated and we’ve needed air valves in every room. To ensure a good air flow around the house, all the new internal doors needed a pre-designed gap at the bottom. The MVHR supplies air to dry rooms and extracts from the wet rooms and the transference goes under the doors. The MVHR unit is located up in the plant room on the top floor, alongside the hot water tank. The ground source heat pump should provide adequate heating for the house but the clients were very keen to have a wood burning stove as a back-up. It has been challenging finding and installing a suitable wood burning stove. The one we’ve found is not completely airtight..but it was the best that were aware of at the design stage, given budgetary constraints. Stoves are fairly uncontrollable and can overheat the house. We’ve only got a minimal total space heating need, so there is a chance of overheating. You might end up having to open the windows in the middle of winter! Stoves can contribute to ‘smoke spillage’ into the room when you open the door to add fuel. The flue and supply pipe of wood burning stoves are also a significant thermal bridge, with cold air going through the stove and taking heat out of the building. Could you clarify ‘heating demand’ please? eg 4 kw per hour/day. We are about to start construction of a well insulated house although not to passive house standard and are hoping to install a suitable wood burning stove. Regarding overheating, we are going for external insulation with lots of exposed mass on the ground floor – do you think that this might appreciably diminish the overheating problem? We are also going for MVHR – we would expect this to redistribute some of the heat from the stove throughout the house. Any views? As well as the aesthetic appeal of the stove, it might be useful when the Russians turn of the gas! I understand the desire to install a wood burning stove, I probably would myself, but if the heating load is only 4kw in the depths of winter and there is a robust heating system installed such as gas or, as in our case here, a ground source heat pump it could be argued the stove is superfluous and will be rarely used. A building fabric designed to this level of thermal performance takes a long time to lose heat even when built using ‘lightweight’ construction such as timber frame. The MVHR system in Passivhaus is designed primarily for the correct controlled ventilation depending on occupancy and not for distributing heat efficiently. It would probably take several hours for a Passivhaus to reach the desired temperature solely relying on a single point stove. But of course if there was to be a breakdown of the primary heating system or a power cut it is very useful to have a back up!